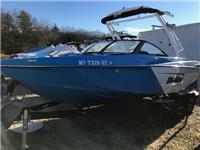 One owner, custom order Malibu 23 LSV. The boat comes with 410 HP high altitude motor, upgraded sound system, extended bimini top and a travel cover. Special options include forward/backward tower lights, underwater lights, extra ballast and wake shape wedge, and a marine radio. The boat was ordered with a diamond hull and matching painted trailer with 18" chrome wheels. This boat has always been stored in a climate controlled garage, and still looks like new! Altitude prop and motor, electric wedge, diamond hull. Full interior lighting, forward/backward tower lights, underwater lights, upgraded sound system with triple amps. Tower, extended bimini top, fat sacs and wake shape wedge. 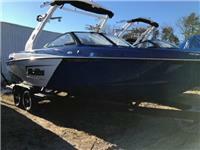 I am interested in your 2012 23 LSV (Diamond Hull) and would like more information. Please let me know. Thank you!